Heyman Dharmendra of Hindi cinema reached Mathura on Sunday to address an election rally in support of his wife Dream Girl Hema Malini. Hema Malini is BJP candidate from Mathura in the year 2019 Dharmendra reached Mathura from Mumbai to support Hema in particular. In the election rally, Dharmendra appealed for Hema in the film style. 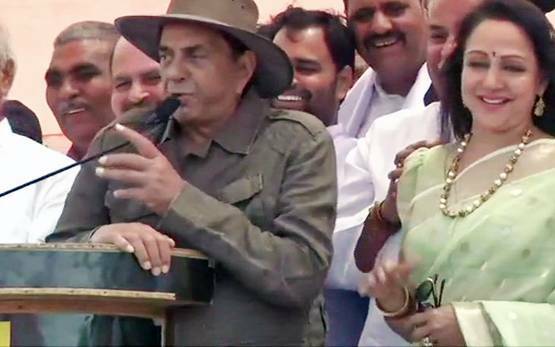 Dharmendra addressed an election rally in the form of Sholay Ke Veeru. Dharmendra urged the villagers to vote for their settlement and said, "If the villagers did not win Hema Malini with good votes, then there is no tank in this village ... I will go to him." Dharmendra's dialogue After the whole public rejoiced with applause. 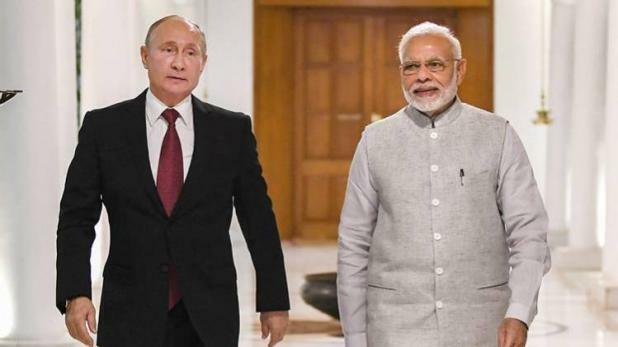 Dharmendra said that every child, elderly and young people from Punjab to Assam and from Kanyakumari to Kashmir, considered India as their mother and India worked hard for the progress of India. We call India a mother. Let's begin to understand your mother, on the day you lift your eyes on your mother, you will see her eyes. Dharmendra said in a special conversation with Aaj Tak, "I am a farmer, I always like to come here." He said, "I have come to the stage of the awakening of India. " On the question of victory and defeat in Hema Malini's election, Dharmendra said, "Hema has become a Member of Parliament, I have come here for his campaign." Whenever a work is done with a good heart, the result is good. Hema has done the same. " Hema Malini, happy about coming to Dharmendra's Mathura, while sharing a special picture on social media wrote, "Today is a very special day for me. Dharmendra ji is coming to Mathura for the whole day and the public is waiting for them to see and hear. These photos have been clicked before going to the election meeting at my house in Mathura. " Tell us, Dharmendra has issued an audio clip in the past and appealed to his wife Hema Malini to vote for them with the people of Mathura. Through their file names in the audio clip, they requested Hema Malini to win a record win from Mathura's voters. Tell me Hema Malini is doing everything possible to win the elections. 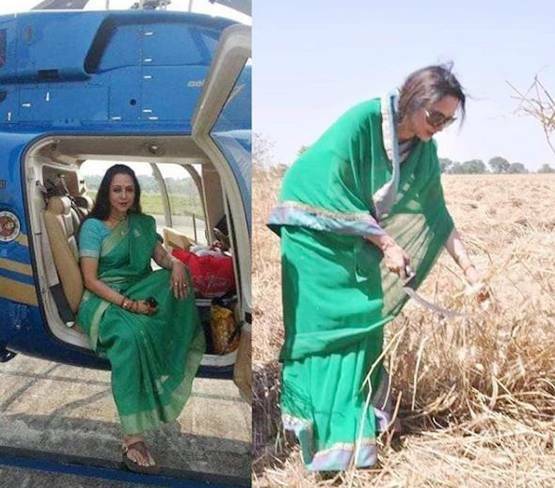 In the past, Hema Malini's pictures were cut viral on social media by cutting wheat in Mathura's fields. While campaigning, Hema Malini had gone to Mathura's fields and the wheat there was seen with people present there. In Mathura, Hema Malini is getting a tough challenge from the Maha coalition this time. SP-BSP and RLD have fielded Kunwar Narendra Singh in this constituency. At the same time, Congress has given a ticket to Mahesh Pathak from Mathura seat.